It was pleasing to see such a fine turnout at last night's Gathering. ...to have available to us such a medium, such a venue, and a dedicated source of artists and promoters willing to sacrifice in bringing to be the essence of our persona and the music we treasure is nothing short of a blessing. Still in a Spectral Voices/Tom Heasley mode upon arriving at St. Mary's last night, both who had most recently appeared here, it took me a while to switch gears and get into the back to basics Berlin-school style of Free System Projekt. But I soon found myself captivated by the mesh of hard driving sequences and softer patterns. At one point, I sensed myself zoning to a Michael Riesman-like driven force, as from Philip Glass' 'Einstein on the Beach,' which I must confess being a place I like to be. However, I'm not sure if any of the many places FSP led me quite prepared me for where Wave World would. 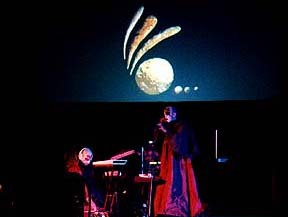 Wave World's set opened with a pair of cloaked and hooded characters bowing at each other on stage. "Okay," thinks this pewed attendee. "And now for something completely different." With projected motion-picture computer graphics artistry, which to me compared to what one might find in an issue of Heavy Metal Magazine (which has nothing to do with the HM genre of music, but has a lot to do with craftily beautiful sci-fi type images) flowing on screen, the boys of the band eventually dehooded (revealing Uncle Festerlike shaved heads) and got down to the business of producing some remarkable soundscapes. The music surged along with the tendered screened alien ecological environments which, I *think*, focused on representing alien species propogation matters. Truthfully, I would really prefer someone else explain the message of the film. Wave World's music also represents the Berlin-school fashion, but, in comparison to FSP, is a less disciplined evolvement of the style, offering many quirks and perks. You watched amazed and smiled and were pleased with the soundworlds. At the end of the set, the guys rehooded, said good-bye and spaceshipped back to Orion's Belt. One wonders now how long it will take to reacclimatize myself to David Darling, who appears next. I haven't posted much to these lists lately, but I just have to say that I made the journey from Hartford, CT to Philadelphia, PA yesterday to see the show and I was not at all disappointed. The performance from Free System Projekt consisted of three long pieces (about 15 - 20 minutes each), much of it ambient with some interesting analogue sequences. I did get to speak to Marcel briefly and he said that the sequence from the second track they played came about from the Okefenokee meeting earlier this year (TD-related content! ), but would not be appearing on the CD that will be coming out from it - he did say that Quantum is going to be producing that release (Marcel, I hope I'm not giving away any secrets here). I am hoping that someday their concert from last night is made available for release - there was one small loss of sound during a sequence that needs to be fixed though before that can happen. I enjoyed it immensely. There was a short break and then Wave World was announced. 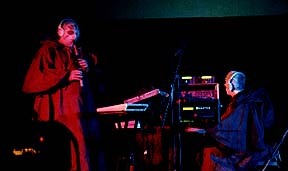 They are most certainly performers in a broader sense of the term, in that they are not only musicians but come dressed in monk-like robes and have a symbol painted upon their faces, they also have an interesting computer generated video playing above them. Their music ranges from floating ambience to fast-paced rhythms and melodies. I recognized many tracks from their first two albums and I'm hoping that some of the others that were played are on the Dimensions CD and the Sphere CD-single I picked up before the show. They seemed to be enjoying themselves because they were smiling and laughing and, at times, bobbing their heads in time with the music. I look forward to see what these guys come with in the future - musically and visually. Highly recommended to anyone who has the chance to go see them. It was nice to meet some list members who were previously just names on email I have received - Thanks to Michael Jean for the company and to the others I met briefly. As Johnny Carson might have put it, "some weird, wild stuff." Yep, you knew something a little different was in store right from the outset. Lime colored balloons bounced upon the stone steps leading into St. Mary's. I soon spotted a comely lass sporting glow stick illuminated cleavage joining the que. The crowd swelled with individuals pierced in the most unconventional of places. "Pretty cool," I thought to myself. Yes, the Gathering faithful were out in full force. But, it soon became evident that the large audience was filled out with what can only be described as a slightly younger, 'avant garde' and very enthusiastic bunch. A refreshing and encouraging addition, I might note. Free System Projekt opened things up. The three young Dutchmen got straight to work with little fanfare. They proceeded to regale the crowd with a virtual homage to the 'old school,' Berlin style of electronic music. But, with a decidedly cutting-edge twist. Each of the three pieces they performed was disciplined, and delicately balanced. I was most captivated by an interlude towards the end of their set. A melody of harpsichord sounding delicacy was inter-cut with laser-like sequencer assaults that darted in from every direction. The contrasting elements intertwined perfectly. It was clear these young men had diligently done their homework. My only suggestion: If you boys must play with your backs to the audience, perhaps you might consider somehow embellishing your backsides to visually engage the listeners. Speaking of embellishment, next up was Wave World. Actually, embellishment is not quite the word I'm looking for...enhancement, perhaps? Before their set even began, it was clear that the members of Wave World lovingly strive to make their performances an all-out, all-encompassing event. Wave World's arrival on stage was preceded by a sequence of peculiar dialogue, rendered in foreign tongues, that bounced between two speakers that bracketed the stage. The two musicians entered slowly from opposite directions, shrouded in medieval robes. They performed an opening ritual of reverent bowing and reciprocal genuflecting with such utter solemnity that it made me giggle. What followed, musically, was astounding. 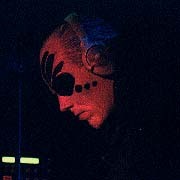 It began subtly, yet quickly blossomed into some in-your-face, full-on, un-apologetically dramatic spacemusic. Just the way I like it. Yes, they were all over the map, but they navigated the terrain nimbly and fearlessly. And, my God...the visuals! Rolf van Slooten's video show was a computer-generated tour de force. Unlike the abstract backdrops of previous gatherings, this video was rooted in tangible, albeit fanciful imagery. In turns majestic, whimsical and even grotesque, it was compelling throughout. One could almost grasp a narrative thread in the ever-changing scenes that ranged from outer space to some otherworldly, underwater seascapes. The video and the audio were in perfect symbiosis. Throughout the set, I observed both musicians glancing up at the huge screen. Perhaps to assure that they were keeping in time with the imagery, or simply to appreciate the visuals along with the audience. From time to time they smiled right into the crowd through painted faces. Their mutual effervescence in performing filled the vestibule. So in tune was the music to the unfolding of events upon the screen, I began to wonder, did the music stand up on its own? As difficult as it was, I closed my eyes on the riveting cinematic display and simply listened. The answer was an unequivocal "yes!" What I heard persuaded me to the point that I'd made up my mind to purchase a CD upon my departure. Alas, Chuck v announced at the close of the show that they had sold them all. Upon reflection, three magnificent moments stand out in my mind. 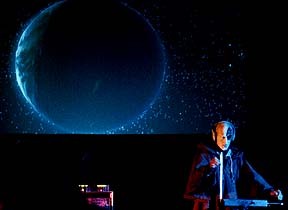 The first, at the outset of the show, featured visuals of quasars and barren planetary perimeters as if seen from the vantage point of a lonely, meandering spacecraft. The accompanying music was suitably arid, tentative and desolate. A truly beguiling sequence had an undersea harem of plant life undulating in unison to a slippery, seductive, middle-eastern melody. The show concluded with a bang. In what I felt was the strongest segment; the audience was sent whipping through a twisting, turning, Technicolor vortex while the music kept the scintillating, breakneck pace. The effect was like being on a virtual roller coaster. A thrilling climax, indeed. Chuck van Zyl's bemused comments at the conclusion of the show reflected the lingering effect I took home with me that evening. Wave World...weird, wild, wonderful stuff.